Numerology's Diamond Spirit guide links your physical body with your spiritual essence. The events and changing circumstances you experience on the physical, mental, and emotional planes affect your spiritual growth. When you become a parent, lose someone you love, or experience another major change in your life, it affects your spiritual outlook and understanding. Conversely, when you have a powerful spiritual experience, it alters the way you view and live your life. This interactive play between the spiritual and material is reflected in your Numerology Diamond Spirit report. The Diamond is one of the oldest number-based methods of divination and perhaps the most powerful tool numerology has to offer. It reveals the chain of cause and effect that connects your physical and non-physical planes. It tells us how your experiences, choices, and priorities in the physical world affect your internal/spiritual growth, and how, in return, this insight affects the quality of your life on the physical plane. Each Diamond pattern consists of four numbers. The first is called the Challenge. Your Challenge is a lesson or test that, once learned, will benefit you for the rest of your life. The second number is the Root or Cause and explains the underlying reason that particular lesson has emerged. The third number, the Recommended Action (also called Action Key), gives advice on the best approach for a successful outcome. The final number - aptly named the Outcome - reveals what the likely result of your efforts will be, and how it might affect your future. With the exception of ages 0 through 7 and 75 through 81 we experience two Diamonds per year from birthday to birthday. These two Diamonds are equally important and tend to fit together as if working on one helps us understand the other. Although most Diamonds are in place only for one year, it's not uncommon for one or both Diamonds to repeat the following year. Often one number - usually the Challenge number - lasts for more than one year, while the other three numbers change. Finally, a number that is the Cause one year becomes the Action Key for the next. The Diamond's structure is complex but also logical and beautiful. A word of advice: getting the most out of your Diamond requires some measure of self-reflection, not unlike the I Ching. I recommend that you read it more than once, then let it simmer. You may be surprised at the amount of insight you gain. Copyright 1987-2015. Hans Decoz. All rights reserved. This report or any portion thereof may not be reproduced or used in any manner whatsoever without the express written permission of the publisher except for the use of brief quotations in a book review. The first number in your Diamond is of a decidedly spiritual/inner nature. It's offered to you in the form of a challenge; something that needs to be learned or acquired to help you grow and mature. It reveals the true purpose of your struggle on the physical plane from a broad vantage point. Anthony, the first number in your Diamond pattern is 3. The goal of this challenge is to enhance your self-expression through confidence and courage in all areas of your life, not just the creative or artistic avenues. It starts by understanding the magnitude of your potential, not the least of which is your imagination. Your inner world should be a dynamic place, where realizations, feelings, hopes, dreams, discoveries, ideas, expectations, and yes, sometimes failures and disappointments, come and go, changing and enhancing you in the process. No supercomputer can hold a candle to the speed and reach of your mind, much less the power of your imagination. However, similar to a computer, it needs an operator to guide it to its full potential. That operator is you, and the more confident and comfortable you are at accessing and using your creativity, imagination, and analytical powers, the more successful you will be in life. It takes courage to go against the grain, to make up your mind and follow your instincts - it's much easier to conform. But in order to be true to your unique potential you must, by definition, find YOUR voice. This challenge inspires you to expand your vision, find that voice, and express your individuality. The second number in your Diamond reflects the underlying cause of the challenge you face this year. It is the catalyst that sets things in motion, the root of the issues confronting you during this period. The second number in your Diamond pattern is 13, which suggests you recently moved through a period where you felt a lack of stability and predictability. You may have experienced unexpected or chaotic circumstances, apparently for no particular reason. This can lead you to feel you should be more in control of our life - you are, after all, the captain of your ship. However, it likely felt as though the ship's wheel wasn’t connected to the rudder – and no matter which way you steered, life pulled you in a different direction. While we all experience this to some extent, you have recently faced it more than usual. A 4 based on 13 implies this ungrounded feeling may be due, in part, to a lack of effort or direction (or both) on your part. The 13 is a Karmic number that points to a past time when you may not have lived up to expectations or contributed your fair share. You are now on a path to set things right; the reward will be more than worth the effort. The third number in the Diamond pattern suggests a possible course of action to resolve successfully the issues facing you during this period. At this time in your life, Anthony, your most valuable asset might be your sixth sense. This Diamond brings a heightened state of awareness. You may feel more sensitive, possibly having vivid dreams or noticing things around you that normally go unnoticed. We tend to be more aware of our intuition when we relax our mind - one reason our dreams seem so graphic and revealing. During this period, rely on your gut feelings and be sensitive to the subtle signals around you. Relax, be in the present, and listen carefully to others (sometimes you learn more from their tone of voice than from the content of their communication). It is also important to be aware of what goes on inside of you, so sharpen your intuition there too. Take time for daily contemplation of your circumstances, how you feel, what you want, and what you sense from people around you. With your mind wide open and your antenna fully extended you may feel more vulnerable emotionally, so criticism may trouble you more than usual. This is an indication that your intuition is magnified, as emotional sensitivity and heightened intuition are two sides of the same coin. Your approach should be to take full advantage of your intuition, while giving less attention to the emotions being stirred. Instinct, faith, sensitivity, and emotional stability, are key ingredients to getting the most out of this Diamond. The fourth number reveals potential changes in your personality and your environment as a result of your experience with the Diamond in place this year. Naturally, our effort and sincere desire to meet these challenges increases the possibility of a positive outcome. Anthony, a 3 in this position suggests you should feel less inhibited and more optimistic. The 3 brings a newly awakened creativity. This is one of the most strongly felt and desirable outcomes, because it seems to directly affect your ability to experience simple joy and happiness, as if the child in you has re-awakened. You may even recognize this in a change of style and taste; you might dress less conventionally or more colorfully, or have a desire to change your environment. Your sense of humor may be less reserved and your health is more likely to improve, due to the positive, motivating outlook of the 3. The first number in your second Diamond is again of a decidedly spiritual/inner nature, offered to you in the form of a challenge; something that needs to be learned or acquired to help you grow and mature. 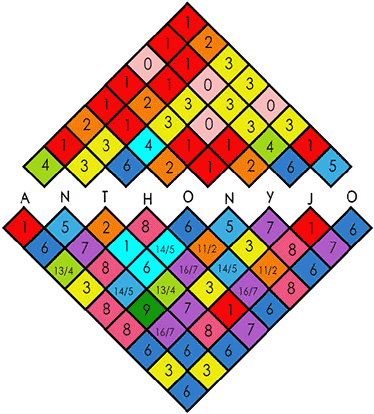 Anthony, the first number in your Diamond pattern is 4. This Diamond involves building strength of character and trust in yourself. To facilitate this lesson, you may find yourself tempted by troubling choices - pyramid schemes, gambling opportunities, get-rich-quick schemes - or face situations where you have to choose between the easy or the hard way. You will be summoned to find your guiding voice, and to strengthen your sense of fairness, justice, and honesty. Personal circumstances that can make those choices even more difficult, often accompany this Challenge. For example, you may have family or co-workers dependent on you, or other pressures that weigh on you. The second number in your Second Diamond reflects the underlying cause of a distinct challenge you will face this year. It is the catalyst that sets things in motion, the cause of the issues confronting you during this period. The second number in your Diamond pattern is 1. At the root of your challenge lies a problem that seems only marginally related - the issue of control. Consciously or unconsciously, it is likely you have been in a position of power and dominance for some time, affecting the lives of others. There are many ways this could have transpired. Others may depend on you financially or emotionally, or you may depend on them; either situation ultimately creates the same imbalance. It may have come about unintentionally as changing circumstances created a pattern of dependence and control. Regardless, you likely have influence over the happiness and well being of others in a way that is less than ideal, creating an imbalance that needs to be resolved. This situation has the potential to limit your freedom, your creativity, and your ability to make choices that could further your career and happiness. The third number in the Second Diamond pattern suggests a possible course of action to resolve the issues facing you during this period. Think of this period as flying a kite, Anthony. You need to keep your feet on the ground, but your focus and ambition should be roaming, swirling and diving without restraint. Your mind should be as free as that kite, but held firmly by a string controlled by (only) you. This diamond suggests it's time to let go of old concepts and ideas, in order to be elevated by your own dreams. Nurture your untapped potential by allowing new ideas to emerge, let go of past habits and worrying what others may think. Although it may not sound very practical, it may help to just watch the clouds go by, get out more, let go of old patterns. There is no better way to get in touch with yourself and your dreams. Allowing your mind to wander and making room for the new are important aspects for recognizing and formulating your dreams. Qualities that will help you navigate this Diamond and take advantage of approaching opportunities are flexibility, adaptability, having faith in yourself, and letting go of old habits and restrictions. The fourth number reveals potential changes in your personality and your environment as a result of your experience with the Second Diamond in place this year. Naturally, our effort and sincere desire to meet these challenges increases the possibility of a positive outcome. Anthony, a 6 in this position indicates strengthened ties with your family, friends, and community. As you exit this Diamond, you likely feel closer to people you care about, and you may find your sense of responsibility and loyalty has improved. The 6 inspires commitment and a stronger sense of belonging. You may feel a renewed sense of purpose, more at ease with your emotions, and less inhibited about expressing your feelings.